This is plate 22 from Robert Melville Grindlay's 'Scenery, Costumes and Architecture chiefly on the Western Side of India'. Grindlay (1786-1877) was only 17 when he arrived in India in 1803. He served with the Bombay Native Infantry from 1804 to 1820 and during this period made a large collection of sketches and drawings. 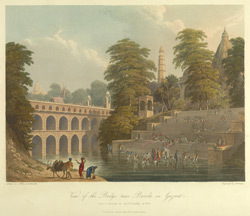 Grindlay writes: "The annexed plate represents a view of a Bridge near Baroda, of peculiar constrcution and solidity ... the object of this sueful and handsome edifice was to establish at all seasons a ready and certain communication between Ahmedabad, the capital of the kings of Gujarat, and Baroda ... The construction of the bridge was obviously intended to afford a free passage to the stream at different heights; but the river ... has been known to rise in a few hours during the rains nearly to the summit of the turrets at the extremities of the bridge. The buildings in the vicinity of the bridge represent the pagodas of the family of the Rajah Govind Row, the father of the late and present Guicowars, and of his minister Rowgee Appagee."